Daily your car is bombarded with rocks, salt and debris at high speeds. As a result, stone chips will begin to take a toll on your car’s paint. 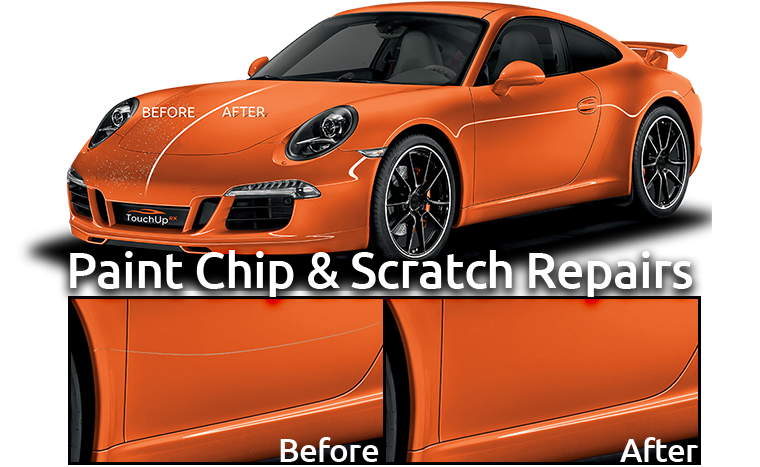 Our TouchUp RX Paint Chip Repair Technicians can quickly and economically repair damage from a few chips to extensive road rash. These repairs are permanent and blob-free unlike touch-up paint. Not only will it make your vehicle look great, it will prevent rust from forming that can cause further damage to your vehicle. Our paint chip repair technicians use the proprietary TouchUp RX Paint Chip Repair System to fix automotive paint chips and road rash. This unique process also protects your car from rust and other long-term damage to the exposed metal. In addition our Professional Paints can be exact OEM matched to your car’s finish to keep it looking great. Let our experienced technicians carefully remove scratches or scuffs on your vehicle so it looks like new again. Learn More by contacting one of our technicians!